Hello, it’s Susan from Love of Home. 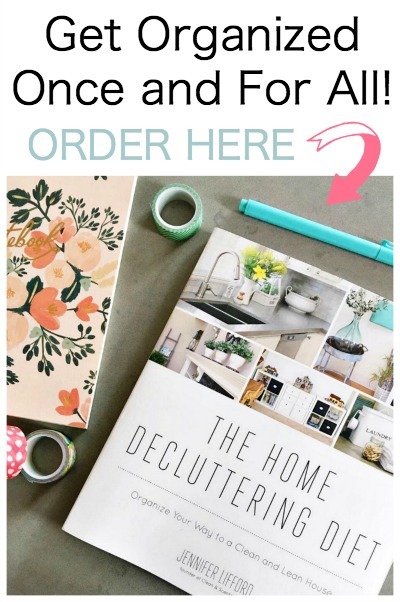 I have a pretty project to share with you today. 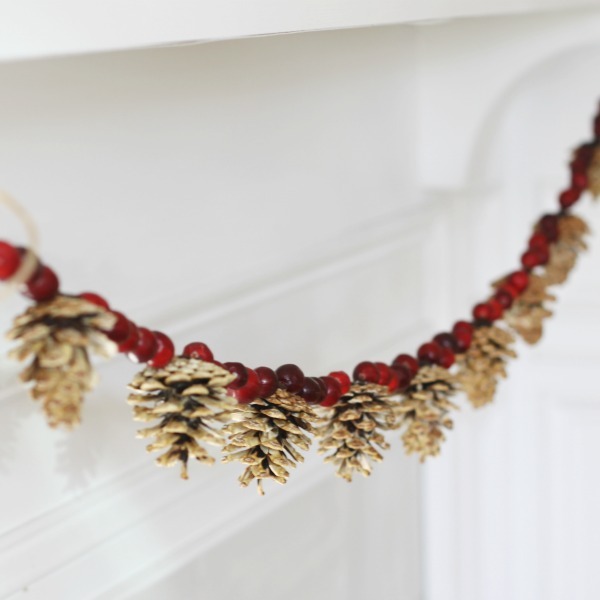 It’s a bleached pinecone and cranberry garland. We have lots of pinecones in my neck of the woods so I am able to go out and pick a bag or two just about any time of the year. If you don’t have pinecones readily available you can buy them at the craft store. Large eye needle. You can find them by knitting supplies if you don’t have one. To bleach the pinecones put them into a bucket or container and add two parts bleach to one part water and submerge the pinecones. Leave for about 1 1/2 – 2 days. Remove from mixture and let dry. They will open again as they dry. Mine looked pretty bad after the bleaching and I wasn’t sure it worked, but they turned out beautiful. I decided about how long I wanted the garland and cut my jute with approximately an extra 18″. 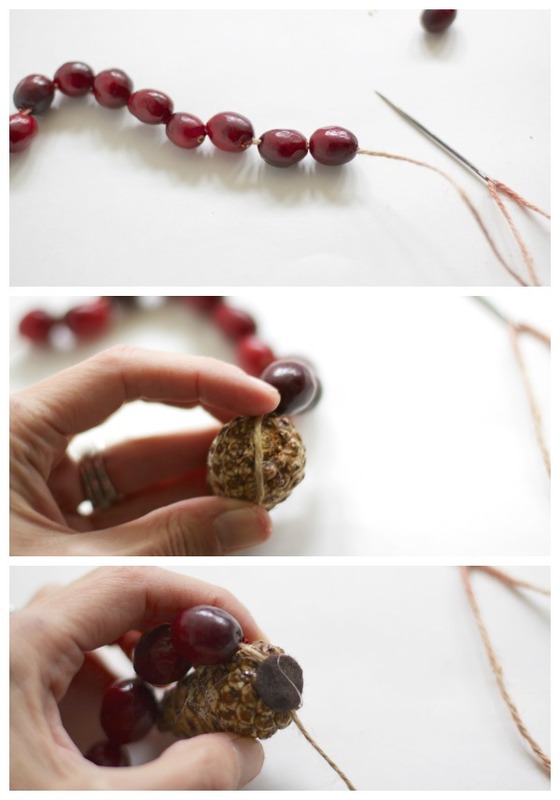 Start by stringing the cranberries one by one. Thread onto the string with your needle. At the ends, I used 10 cranberries, then a pinecone, then 5 cranberries, repeat to the end, end with 10 cranberries. 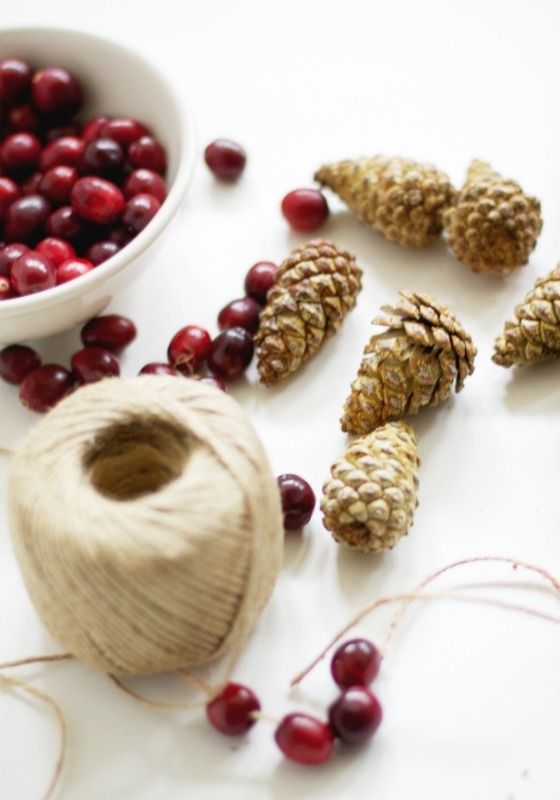 The pinecones were kept on the string by gluing the string down with the felt circles (see photo above). The design is completely up to you! The end of the jute nearest the needle took on the red of the cranberry so I left myself enough room to cut that off when I was done. The garland was hung on our mantle, but you could use this around a door, on a tree or make tiny ones for gifts. I love the look of the bleached pinecones it’s lighter look than the natural color ones, but those will work just as well. *One note, since the cranberries are fresh the garland will last about 7-10 days depending on where you hang it. Love this idea and God knows I have plenty of pine cones around here. Looks gorgeous Susan. LOVE, LOVE, love this! Pinning! Wonderful Susan! Pinned & shared!